I have always been a reader, not a voracious reader, mind you, but someone who always enjoyed getting lost in a good story. As a child, my mother took me to the library on a weekly basis, and I was fond of these trips and getting new books to read. As school got more intense and life busier, I gradually read for pleasure less and less. As an adult, especially, my reading life took a major hit from work and life demands, as well as the fact that we moved to Illinois. We found that because we lived outside of town we would have to pay for library cards, and that simply was not in our budget at the time. For several years I really rarely read anything more than blog posts and online articles. Sad, but true! We did have access to Kindle books, but for a long time I really did not even know what to read, so even that resource was of no use to me. Then, 2 years ago a couple of things changed. First, I had our second child and found myself with a lot of time on my hands, sitting nursing a baby with nothing else to do. Second, I had found out about the Charlotte Maon philosophy of homschooling and her emphasis on living books. Pretty soon, I found the free curriculum at AmblesideOnline.org and started pouring over the booklists there. And oh, the free Kindle links were a feast for my poor, reading-starved mind to behold! Suddenly, I had a sizeable laundry list of time-tested literature that I had never read, all right there on my phone. 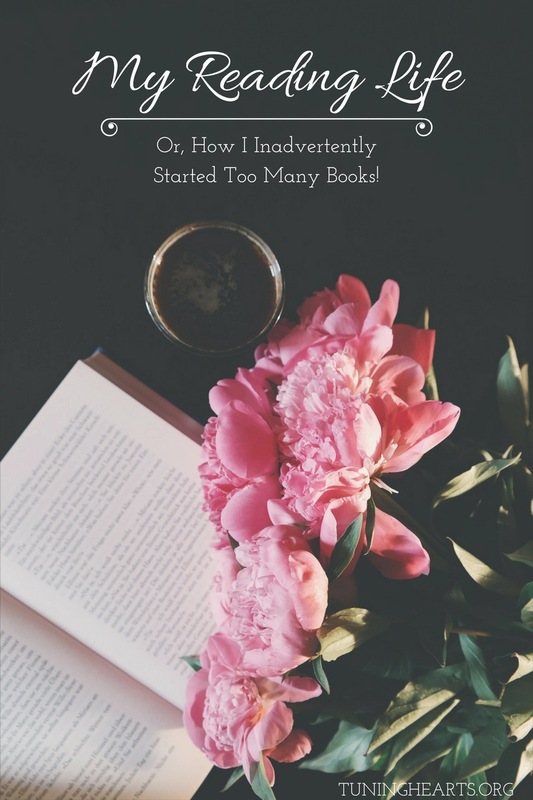 I started reading as many as I could, and that went pretty quickly at first because I started with the first grade level books and just read through them one at a time. At the same time, however, I also started listening to several podcasts and reading more blogs about classical education. One of those podcasts was the Close Reads podcast from the CiRCE Institute. It was fun to listen to the hosts discuss books, but even more fun if I was reading along. So I added whatever they were discussing to my growing reading list! Then I joined the AmblesideOnline forums and discovered their book discussions. More books to read and talk about! Somewhere around this same time period I also found out about all the free classics on audio at Librivox.org! Can you see how this is going? I went from hardly reading anything at all, to reading ALL THE THINGS in a matter of two short years. Lately it has been feeling like I might have too many books going at once and that I should probably try to just get through a few to get them off my list. But when you only have a few minutes here and there between taking a toddler to the potty and reminding a 6-year-old to take his shoes to the mud room (for the 5th time in the last 10 minutes!) and trying to make sure the rice for dinner isn’t boiling over on the stove. . . Well, it is hard to get through a chapter of something, let along a whole book! Besides, I know that dear old Charlotte Mason advocated slow reading, and it seems that I am going very slowly indeed with so many books on my plate at once! But I am not complaining. I am loving my reading life right now, even though I would like to organize it a bit better, perhaps. I have almost wondered if I shouldn’t assign certain books to certain days just to keep them all going at a steady pace. How about you? What is your reading life like? Do you like to finish one book at a time, or do you keep a few (or several) going st once? Do you have a good system for keeping multiple books up at the same time? If so, do share! I’m all ears! Lol, okay, I think you have me beat!